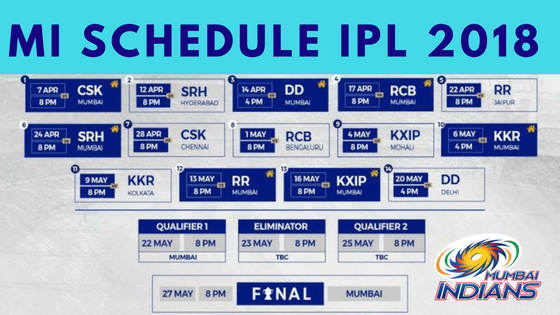 IPL 2018 Mumbai Indians Schedule-Where To Buy Tickets? Again Crix11.com brings out precise details of every hook and nook happening in Mumbai Indians including MI Shop, Schedule, Ticket Booking And yes!! Digital interface exclusively for our reader #CricketMeriJaan #MI _Paltan. In this post, you will get all the details of Mumbai Indians like MUMBAI INDIANS Schedule, pitch condition, Tickets availability, Television Guide & Digital Guide at Wankhede stadium of IPL 2018. See Chennai Super Kings Schedule of IPL 2018. In Wankhede Stadium Mumbai, 8 matches are scheduled. MI will play their seven League games, one game is booked for a qualifier-1 and one is for the IPL 2018 finals. Out of 9 matches, only 2 matches will be played at 4 PM and the rest will be played at 8 PM. Hardik Pandya, Rohit Sharma (captain), Nidheesh, Mustafizur Rehman, Siddesh Lad, Jasprit Bumrah, Anukul Roy, Pradeep Sangwan, Kieron Pollard, Krunal Pandya, Ishan Kishan, Sharad Lumba, Evin Lewis, Mohsin Khan, Rahul Chahar, Ben Cutting, Pat Cummins, JP Duminy, Saurabh Tiwary, Tajinder Singh Dhillon, Mayank Markande, Jason Behrendoff, Suryakumar Yadav, Tare. In Mumbai Indians shop we will find all the products related to MI team. MI fans must have a look at their shop. You can find many cool pieces of stuff here. Cool emoji and cartoon characterization of players gaining its popularity especially among school going and college students. Gadgets of Mumbai Indian includes from bags to boomerang to coffee cups etc. Fans of Mumbai Indians can download cool emoji from the official website www.mumbaiindians.com to buy gadgets and other cool stuff to support #MI Paltan you can easily get it from www.souledshop.com that is being linked from the official website of Mumbai Indians. April month anyway is trending with memories of the famous World Cup win 2011 and whenever cricket fans cherish those moments Wankhede stadium placed its mark. It was rejuvenated with the capacity 45000 sitting arrangement for 2011 world cup. This IPL final like previous seasons will be held at this stadium. Looking at its history it was built in 1974 and contractor of this stadium was Billimoria and Company, since then its popularity spurred with each one-day Internationals matches and IPL matches. Ends: Garware Pavilion End, Tata End. Considering the geographical location of Mumbai which is near the seaside, the cold breezes coming from the Arabian Sea makes weather humid. Humidity on the pitch makes it easier for chaser to chase the target easily in fact seeing last 4 match stats; team batting second has 100% winning record. Team who opt to bat first might face problem during initial overs as it favors Fast bowlers. Overall this is a flat batting pitch with mid high scoring runs with favorable to spin bowlers later in the matches. Dew play an important role in this ground. The team winning the toss loves to bowl first. 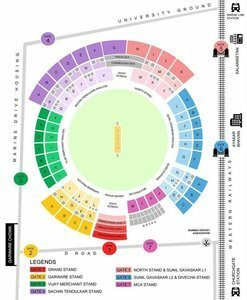 Witnessing growing popularity of Wankhede Stadium prices are categorized as per the stands named after greatest Batsman of Indian cricket team. Prices vary from as low as INR 800 to as high as INR 8000. No such official Statement is being released from Mumbai Indians Side for availing Tickets over the counter, in usual circumstances stadium ticket counters available to serve. Online tickets will be booked at the official website of www.bookmyshow.com as they are the official partner of MI. On opening BookmyShow app or website you will be asked to choose the seats related to following stands with different prices. You find the whole layout to make the task easier for customers. The layout will look similar to this image which we have published in this section. Fans can now easily enjoy the game of IPL by cheering their favourite team by switching to following channels across the globe for live streaming. You can also watch IPL 2018 Live in other countries on below-mentioned Channels.